Quan Yin (also spelt Kuan Yin, Kwan Yin or Pinyin Guanyin) is well known as the compassionate Regarder of the Cries of the World. As we shall see, this Form of the Universal Dea is of great relevance and importance to our current world, providing us with a means of approach to the Daughter-Savior stream of Divine Compassion. Instinctively many people in the West who love God the Mother turn to Quan Yin. This is a very sound and important instinct, because Her cultus is probably the most important surviving form of the ancient cultus of the Sacrificial Savior in Her original feminine form. In this respect, Quan Yin is closely related to Persephone, the Sacrificial Daughter and to the various ancient sacrificial Goddesses, such as Ishtar and Inanna. 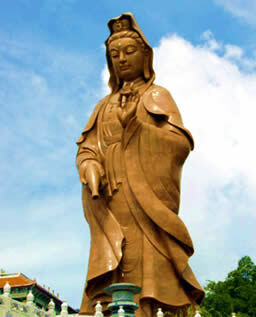 In terms of actual devotion, however, Quan Yin is more valuable to us: firstly because Her cultus is still alive and practised, which is far more spiritually efficacious than trying to "revive" a cultus that is long passed from the earth and can only be reconstructed from guesswork and profane scholarship. Secondly, and almost miraculously – but in fact Providentially – the cultus of Quan Yin is closer to the original than any of the more ancient versions (except those that only survive in iconic form from pre-patriarchal civilizations). There is no male consort here. We are back to the pure and simple story of the noble and compassionate Dea giving Her life for the salvation of all beings. The original story of the Sacrificial Daughter, as reflected in The Gospel of Our Mother God is, in essence, as follows. Humanity, having strayed from the Mother, is in need of salvation. Her brightness is now too great for us to look upon. In the Devi Gita and elsewhere, even celestial beings are overwhelmed by the unveiled vision of Dea. Therefore God separates Herself from Herself and gives birth to a Daughter who is Herself. This mystery is often depicted in terms of the Solar Mother – whose light, like that of the sun, is too bright for creatures to gaze upon directly – and the Lunar Daughter who, like the moon, reflects and softens the Solar light so that we may look on it. The Daughter is thus the mediatrix of the Divine Light: the primordial Priestess or Pontiff (bridge-maker). However, while the Daughter is mediatrix between the Heaven-world and the middle-world, or earth, there is still the under-world in which many souls, having sunk below the human state are trapped. The Daughter, therefore, gives herself up to Death and and enters the underworld, from which she returns triumphant in resurrection. This mythos can be understood on many levels. The underworld may be seen as lying within ourselves, and we may participate in the death of the Daughter, becoming reborn with Her and casting off our lower selves. This is not a "psychological interpretation" of the mythos (except insofar as it is a journey of the soul or psyche). Dea is real, and while She exists in us – as She exists in all things – She is not our creation. We are Her creations. We mention this because there are some attempts to "psychologize away" Dea and see Her as a mere product of the mind. This tendency we, as Her devotees, must firmly resist. The sacred mythos is much more than pretty stories or allegories. It tells Truths that lie beyond the reach of everyday reason and can only be conveyed mythically. What we must understand is that mythos is not less real than "factual truth": it is more real. History tells of things that might or might not have happened. mythos tells of things that cannot not be. 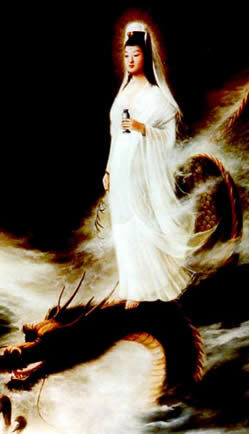 How then, does the story of Quan Shi Yin relate to the primordial mythos of the daughter? In one important story, Quan Yin is depicted as being murdered and descending into Hell. There, She played music, and flowers blossomed around her, turning Hell into a paradise simply because She was there. In other versions, we are told that she released Her accumulated good karma thus freeing many suffering souls back to Heaven. This is the equivalent of the Harrowing of Hell in the Christian mythos. These tend to be dismissed by both profane and Buddhist scholars as "legends" or "folk traditions" irrelevant to the actual Buddhist doctrine of the Bodhisattva. Actually they are far from irrelevant on two grounds. In the first place these stories provide continuity between the original Goddess and the "Buddhized" version of Her. We see that She is, in origin the same Sacrificial Daughter that is Persephone, Ishtar and Inanna, but actually preserved in a pure, less patriarchalized form. Secondly, the Bodhisattva doctrine and the story of the descent and sacrifice of the Daughter are thealogically identical. In Buddhism the Divine is seen in non-personal terms, and from the "subjective" point of view (i.e. as a state of being – Nirvana – rather than a Being). This point of view does not conflict with the more explicitly theistic point of view. Indeed, Hinduism is able to incorporate both views harmoniously. Buddhism, being a later religion, formed in the Kali Yuga, tends to economize the Truth down to a single aspect (just as Christianity and Islam each economize the truth down to a certain theistic aspect). Enlightenment, in the Buddhist sense, is the state of being Divine – of returning to Godhead in Theistic terminology. Therefore the refusal of Enlightenment by She who is in fact Enlightened is the same as God putting off Her Own Godhead. Thus the mystery of Dea separating Herself from Herself to become Her Own Daughter is expressed precisely in Buddhist language by the Vow of Quan Yin Bodhisattva. In modern Filianic Mythos (expressed both in the Mother Gospel and the Filianic Creed), the Daughter voluntarily "takes Fate upon Herself" (an act commemorated at the Feast of Lights in early February) and ceases to be God, "becoming maid" . She later, at Eastre, descends through the seven gates of Hell and is slain and is finally resurrected by the tears of Her Mother and leaves the under-world, freeing the souls imprisoned there. Filianists claim that although their precise version of the story appears to be of recent origin, it is the closest thing possible to the true original mythos and is the proper devotional framework for devotees of Dea in this late Kali Yuga. 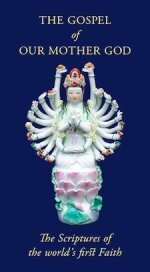 However, for those who feel uneasy with a "new" mythos (most Filianic material seems to have appeared on earth some thirty years ago), the cultus of Quan Yin provides the Daughter Mythos in a form that is part of a living tradition, is thealogically accurate and largely untainted by patriarchal redaction. The "folk legends" (that is, a close equivalent of the original mythos preserved in folk-memory) allow us to approach not only the exact thealogical equivalent, but even the mythos itself. Only the figure of the Mother is missing, but from the Buddhist perspective, the Mother is seen as Enlightenment Itself (a statement with which no Déanic thealogian would actually quarrel, even though she would see it as limited) and may be taken as being not unseen precisely because "Her brightness is too great for us to look upon". Since the "legends" are regarded as peripheral to the thealogy, even some of the more conservative devotees feel free to "re-shape" them for personal devotion into a more Filianic form. Even among Filianists, the image of Quan Yin is often seen as the perfect representation of the Sacrificial Daughter. Statues and images of Quan Yin are likely to adorn the altars and places of worship of Filianists and non-Filianists alike. And for those of us who adore the beauty of the Filianic faith and festivals while having some reservations about something that seems to approach a "new revelation" even though of something indisputable ancient and traditional, the image of Quan Yin makes a perfect halfway stage. Once again, in this as in all things, Quan Yin proves to be the Great Mediatrix. In Quan Yin we see the Holy Daughter, Our Saviour: the Regarder of the Cries of the World, who has vowed to save all beings, even to the last blade of grass. The Gospel of Our Mother God?